I read this and felt it was important enough to share with our readers and members. It is good food for thought. via Brand Strategy And The Paradox Of Different: Branding Strategy Insider. Flash sales can be useful or wasteful. How do you manage discount sites for optimal revenue generation? Be sure to attend our panel of experts to help you navigate these issues and avoid the pitfalls. Flash Sales: Curse or Blessing? How do some hotels get a variety of rich media and content posted under their listing on Search Engine Results Pages (SERP?) In the example below you will notice the Montage Hotel has limited information while Pacific Edge Hotel, and the Inn at Laguna Beach both have Google Reviews and a Rate listed. Consumers are impatient. Hotel reviews are important factors in making their booking decisions. 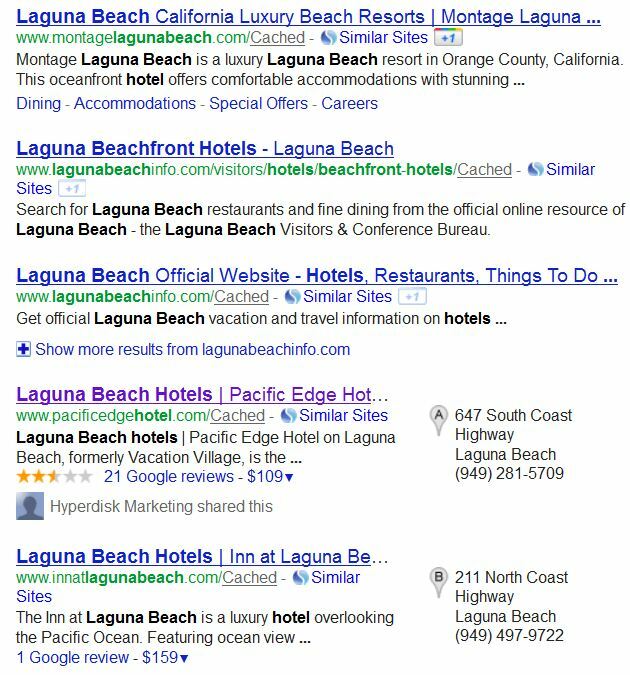 By incorporating “Rich Snippets” into these hotels’ website programming, both Google Reviews and rates are visible directly in the search results. This helps increase traffic over the hotels (Montage for example) that do not have this data available. Rich Snippets include micro-formats. Be sure to have your SEO company or online marketing partner using this programming to increase your search engine program’s effectiveness. To see if your site utilizes Rich Snippets, or if your competitors are ahead of you on this, use Google Webmaster Tools to check it. | Google+ Ripples: A game changer for small business? | READY2SPARK. Truly excellent blog on how to utilize social media; great for hotels that either want to supplement their brand’s efforts or expand their own efforts. ReTargeter » David vs. Goliath: The Battle For Hearts And Clicks [Part 4]. Every day at 5PM the hotel would send out a Twitter-only Last-Minute Special that was 25%-30% below BAR (discount varied based on number of empty rooms available for the night). All 8,000-10,000 Twitter followers received this last minute special. Potential guests, new and old, frequent and occasional, were waiting for these last-minute specials to book via their mobile phones or call from the airport or from the taxi cab while en route to the hotel (5PM traffic to Manhattan – you get the picture). There have been numerous cases when people were waiting in the lobby of the hotel to receive the 5PM last-minute deal and then walked up to the reception desk and booked their stay right then! There have been many cases where guests arriving with advance reservations booked at much higher rates via the hotel website, voice, GDS or an OTA, demanded at the front desk to be accommodated at the lower “last-minute rate of the day.” The front desk had to oblige reluctantly. Major ruckus and noisy scandals at the front desk were a common occurrence on a daily basis. In 6 months or so the hotel discontinued the practice and spent at least a year after that repairing the damage to its price integrity.